Samford University’s Orlean Beeson School of Education’s Educational Specialist (Ed.S.) in Instructional Leadership program received national recognition status from the Educational Leadership Constituent Council (ELCC) on its first submission. ELCC is a national Specialized Professional Association (SPA). This addition brings the total number of nationally recognized programs to ten for Samford’s education school, the highest number of nationally recognized programs in the state of Alabama. Samford’s Ed.S. program is the only program in the state of Alabama to be nationally recognized by the (ELCC). The program is directed by Jane Cobia. 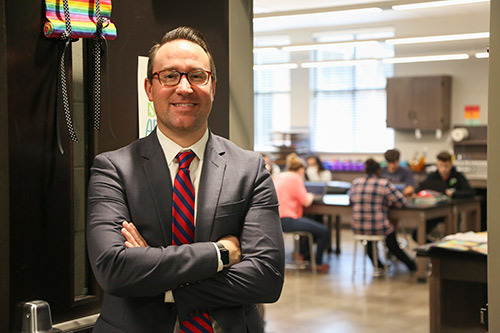 Submitting programs for national recognition is not a requirement in the state of Alabama, but faculty and staff in the education school have made a goal to have all programs nationally recognized. “We will continue to take the necessary steps toward recognition because we take great pride in ensuring our programs meet the high level of distinction outlined by national guidelines,” said Bost. Many programs are recognized by more than one SPA due to having multiple certifications in the program. Each certification within the program must meet the requirements for its respective Specialized Professional Association. Eight out of the ten nationally recognized education programs have received national recognition on their first submission. According to Bost, preparing a report for SPA submission is a tedious process. Collecting data and preparing the report can take years, and often, submissions do not receive recognition without multiple revisions. B.S.E. in Early Childhood, Special Education, Elementary, Elementary Collaborative is recognized by the Association of Childhood Education International, the National Association of Education for Young Children and the Council for Exceptional Children. B.S.E. in Secondary English is recognized by the National Council of Teachers of English. B.S.E. in Secondary History and Social Studies is recognized by the National Council for the Social Studies. M.S.E. in Secondary Social Studies is recognized by the National Council for the Social Studies. M.S.E. in Secondary Physical Education is recognized by the National Association for Sport and Physical Education. M.S.E. in English is recognized by the National Council of Teachers of English. M.S.E. in Early Childhood Education and Elementary Education is recognized by the National Association for the Education of Young Children and the Association of Childhood Education International. M.S.E. in Instructional Leadership is recognized by the Educational Leadership Constituent Council. M.S.E with Gifted Certification is recognized by the National Association for Gifted Children/Council for Exceptional Children. Ed.S. in Instructional Leadership is recognized by the Educational Leadership Constituent Council. All recognized programs are listed on the Council for Accreditation of Educator Preparation website as well as the respective national specialized professional association websites. The school has been accredited by the National Council for Accreditation of Teacher Education since 1954.